Suriname is a country that few know anything about, including myself. After spending a week or so in Guyana I figured I would explore their neighbour to the east. My flight took me from Georgetown right into the Paramaribo City airport (Zorg En Hoop airport), which is handy considering their international airport is almost 60 minutes south of the city. I took a short taxi ride to my hostel, Die Kliene Historie Guesthouse. They had just celebrated their one year anniversary a few months before I arrived, so the place still looked fresh and new. Because I flew into the smaller local airport, I wasn’t able to get any local currency. So first things first: after checking in I grabbed my wallet and headed for an ATM. This posed to be a bigger challenge than I anticipated. The entire country seems to only accept Mastercard. My wallet full of Visa cards meant that a cash advance from an ATM was out of the question. This is a travellers lesson that I’ve learned the hard way. My undiversified wallet meant that I might be cashless in Suriname! Five ATMs later, I was finally able to take out some cash at the Republic Bank Suriname on Grote Kerk Street. The ATM there supports withdrawals on the Plus network. Phew! 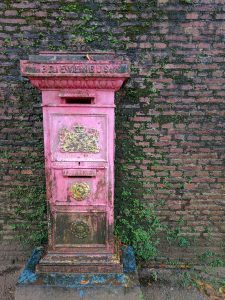 An old Dutch mailbox: Brievenbus. 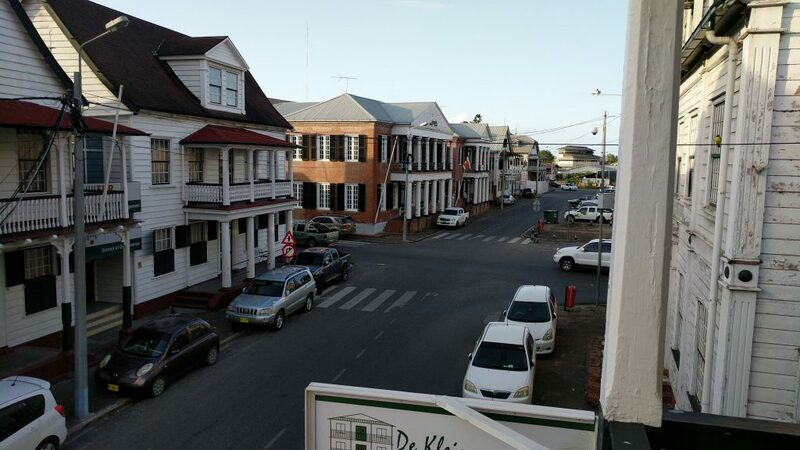 Suriname is a country stuck between two worlds. 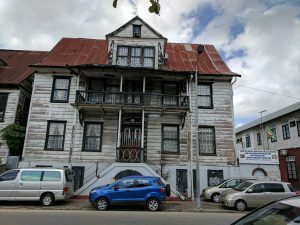 On one hand you have the old remains of the Dutch colony, the official language is still Dutch, and the colonial buildings have that European “feel” to them. On the other hand, you have a history of violence and civil war that has ravaged the country after their independence. 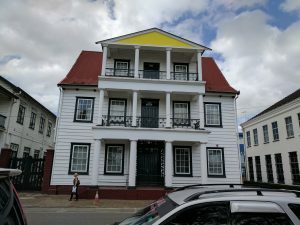 Just before the Netherlands pulled out of Suriname in 1975, nearly one third of the population emigrated to the main land as they feared that the country would be worse-off after independence. They were right. Over the next thirty years there will be as many as four coups against the government, a dictatorship, and a civil war. Today there really isn’t much to the country other than gold mining in the jungle and exporting bananas and rice to the United States and Canada. An example of a well kept building. An example of a building that needs some upkeep. If you can see past the derelict units, you can pretend that you’ve transported yourself back in time to when the Dutch still lived here. I didn’t plan on doing anything else but hanging around the city and meeting fellow travellers in the hostel. 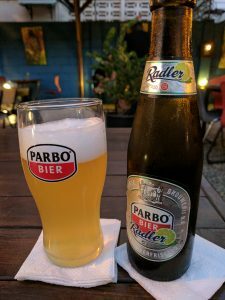 As such, I ended up drinking way too much of their local beer: Parbo (a play on the name of their capital: Paramaribo). The radler is actually quite tasty. I was curious to know why there were so many Dutch people here. Turns out, this is a popular destination for the Dutch to escape the cold European winters. Wow! Unless they know something I don’t, Is flying 8 hours across the Atlantic to some poor South American country that happens to speak dutch worth it? I don’t think so. 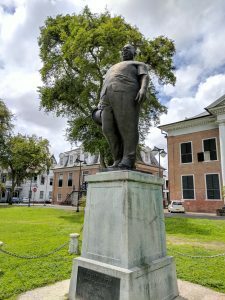 That said, this statue of one of their more prominent (non-corrupt) Prime Ministers during the 60s always makes me chuckle. Johan Adolf Pengel was a prime minister during the 60s. Under Pengel’s government, the Surinamese infrastructure was strongly developed. Roads were constructed and existing infrastructure was strongly improved. The international airport is currently named after him. The main attraction in Cayenne (the capital) is the launch of the European Space Agency rockets. I missed a launch by one week. They are still under French rule, and as such use the Euro. Fellow travellers have told me that it’s quite expensive to visit. So, I found a flight from Paramaribo to Belém, Brazil. The next month in this Portuguese country will test my strength and will power to continue on this world wide journey.